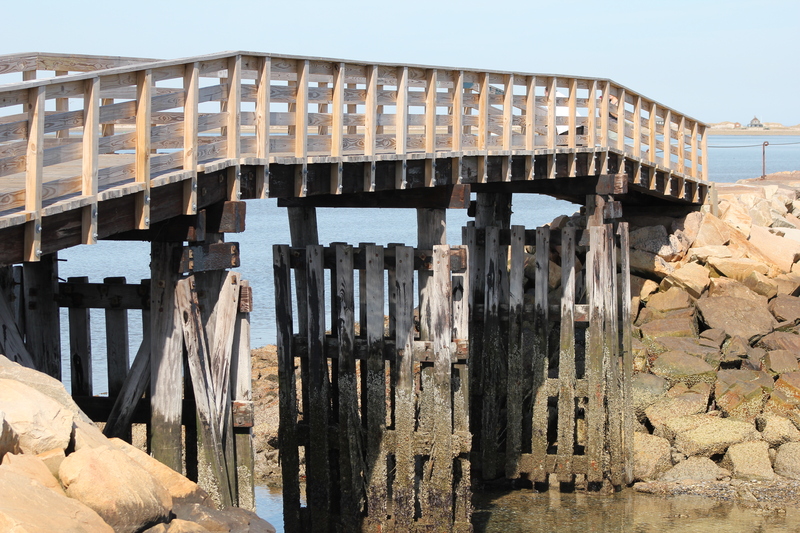 Gina and the Big Dog had a serious difference of opinion about this cool spot which has long anchored the redevelopment of the historic Plymouth Cordage Company factories in North Plymouth. It wasn’t the decor, which we agreed was a beautiful tribute to the old building and an elegant reuse. It wasn’t the food, which we agreed was delicious and creative. But more on our differences later. On a frigid Tuesday evening, we were among several parties gathered around the warmth of the soaring bar. Tim, our cheerful and helpful bartender, offered us a stack of menus, including a special weekday prix fixe menu, where for $21.95 apiece, we could have chosen one each from a select list of appetizers, entrees, and desserts. Not being dessert eaters, those arrangements rarely represent a good deal for us, although the options all sounded wonderful. In fact, the menu itself was worthy of note. Each artful description noted the dominant flavors, not every ingredient like some places do. As we often do, on this night we opted to split an appetizer, a salad, and an entree. We started with a glass of Crios malbec for Gina and a Wolf Blass shiraz for the Big Dog, each $8 per glass. The shiraz was particularly outstanding, and we noticed that the RooBar has had some sort of accolades from Wine Spectator. 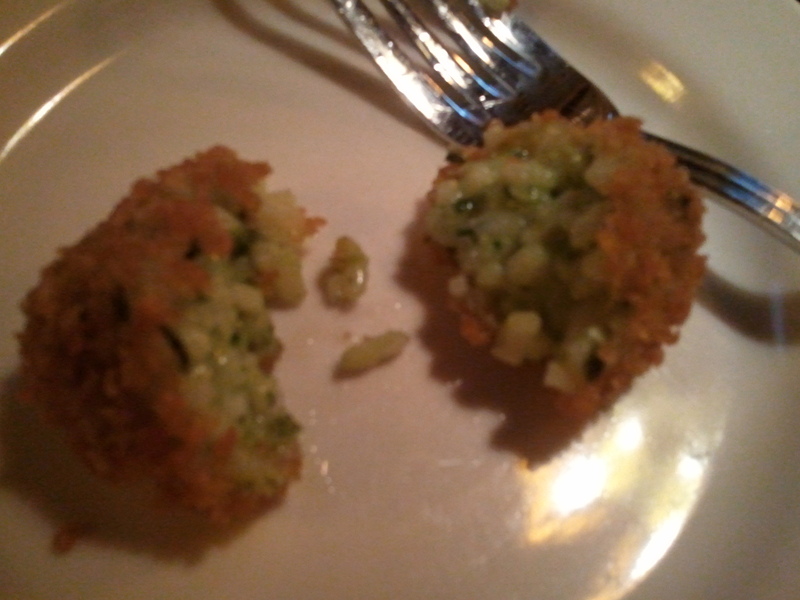 So, back to our pesto arancinis. Our order ($8) included a half dozen perfectly prepared bites of cheesy risotto, coated with panko crumbs and lightly fried. They were good without their accompanying red pepper mayonnaise, but to be honest, the sauce was pretty good on its own, too… and on the hearty bread that started our feast. Yum, said the Big Dog. The Dog has learned that Gina is always going to order a roasted beet salad whenever it appears on the menu, so he suggested it preemptively. This version ($7) arrived with very cold beet slices arranged on an icy plate topped with lightly dressed greens, chunks of goat cheese, and candied walnuts. We liked it a lot. Meanwhile, we snuck a peek at the food being served to our fellow diners, all of whom seemed to be regulars, and started planning our next visit. One diner had a salad with a giant slab of salmon on top, and we looked forward to our entree, described as “pan roasted Atlantic salmon with baby gnocchi, portabello mushrooms, spinach and sweet vermouth Dijon cream” ($23). Here’s where our difference of opinion emerged. Our entree arrived exactly as promised, with the tiny gnocchi maybe given a little pan sear first, to create a delicate crust on the hearty pasta. The sauce was delicious and the salmon perfectly cooked. But yes, the salmon was an unexpectedly small portion, especially given the enormous fish on the salad next to us. The Big Dog contended that we had to take points off for skimpy portion size — our loyal readers demand honesty. Gina, on the other hand, felt that the dish was so unbelievably yummy that a serving of any size would have seemed insufficient. And we’re thinking that it was probably representative of the restaurant’s approach: a dish that was unusual but not weird. We visited another spot in Plymouth recently that insisted on clever twists to classics, and the result was simply revolting, so we know it can happen. Gnocchi is often gummy, salmon often dry, and arancini can be a mess, but at RooBar these dishes were expertly prepared and flavorful. You be the judge: We highly recommend RooBar, and bet that on a weekend night, it’s a hopping nightspot where the great food is a bonus. We discovered Alden Park one Saturday afternoon while undergoing retail therapy at Colony Place in Plymouth. The place was empty, the food was delicious, and the affable bartender, Brian, suggested we come back for an organic food and wine dinner scheduled for a future Thursday. So smitten were we by our snack of corn chowder, sirachi chicken wings, and the Park salad (like a Greek) that we signed up for the dinner on the spot. We recruited some friends we hadn’t seen in a while and were seated in a booth in the restaurant’s main dining area, minimally separated from the large and bustling bar. Engaging conversation caused us to overlook the evening’s two very minor flaws: pacing was a little slow at the beginning, and the wine guy’s brave efforts to outshout the bar crowd were unsuccessful. But the food and its presentation were remarkable. The first course consisted of three large grilled scallops, each set atop a little dollop of corn puree, then red cabbage braised with bacon, then a barely warmed asparagus tip, and each scallop was dressed with a drop of herb oil. Arranged on a white rectangular plate, it set the tone for the dinner. It was served with a crisp King Estate pinot gris, which even the white wine averse Big Dog thought was the best of the meal’s four pours. This was followed by a salad presentation so unique that The Big Dog took a photo with his cell phone and sent it to a friend who just hours earlier observed that taking photos of restaurant meals is “lame.” A whole romaine heart was stood on its root end on an X of paper-thin cucumber, with its top trimmed with a tousle of pear and carrot strands, and drizzled with balsamic and fig vinaigrette. This came with a Santa Julia malbec, which we normally love but seemed kind of wan. Next up: a half roasted chicken — moist and flavorful with a crisp skin. Underneath we found chewy chunks of fingerling potatoes tossed with cherry tomatoes, onions, capers, and spinach. It was a generous serving, and the four of us began to falter. We washed it down with a Lange pinot noir — again, not stellar, but could that have been because the food was so spectacular? We took a deep breath and tucked into a slice of pumpkin cheesecake, more cake than cheese, served with chantilly cream and a ribbon of cranberry puree. This was paired with a Cecchi moscato whose cloying sweetness made us all think of waffles. The dinner was $58 apiece. For chowhounds like us, it was an excellent value, although we would never order that volume of food and drink under normal circumstances. Lop off the price of dessert and dessert wine, and one appetizer, and all of a sudden it’s a moderately priced meal out. Alden Park is in a strip — oops! — lifestyle mall, and Gina admits that first Saturday visit was really just a clever ruse to get close to the Coldwater Creek and J Jill stores. But the sleek design inside Alden Park, and a cozy looking heated patio we’ll have to try next time, will make you forget where you are. It’s probably a great place to stop for a beverage if you’re already dressed up for something else, but it’s the inventive, tasty, and well presented food that really shines. Ella’s Wood Burning Oven Restaurant may be the closest the Southcoast area of Massachusetts comes to a true celebrity chef. Patrons know the youthful entrepreneur’s name — Marc Swierkowski — and give him a wave when he emerges from the back of the open kitchen. Waitstaff reverently introduce specials with, “Tonight he’s created….” He appears to be on duty every moment that the restaurant lights are on. His wife, Bree, is the general manager. The parking lot always seems full, and hungry diners are often disappointed by a multi-hour wait in a crowded entry or miniature bar. Happily, the attention is warranted, and if you ever drive by that parking lot and see an empty space, we strongly recommend stopping in. The food is expertly prepared and beautifully presented, and uses interesting local ingredients in seasonal menus. The decor is exquisite, the service is friendly, and the wine list is varied. Yep, it’s pricey. But Gina and the Big Dog are experts at smart ordering, and we recently enjoyed a delicious and expansive dinner, with a couple of glasses of wine, for just $65. The Big Dog started with a very good clam chowder, decorated with whole clams in their shells which may have been the highlight of the dish. Gina enjoyed her favorite salad, roasted beets with goat cheese. In this case, the beets were yellow and may have been steamed instead of roasted, but they were dusted with delicious fresh mache and candied pecans. We planned to order a yummy-sounding bruschetta du jour featuring peaches, but we forgot, and were glad we did when the bread basket arrived. Swaddled in napkins and laid in an oblong bucket, the slices of French bread are served with a trio of dipping sauces — this night, they were hummus with rosemary, parmesan olive oil, and a stupendous arrugula pesto. Pasta dishes come in small and large, and we each ordered a small version as our entrees. Gina’s eggplant involtini with smoked mozzarella was served inside out — the pasta was rolled inside the eggplant slices, doused with chunky tomato sauce, and topped with a slice of mozzarella whose smokey flavor permeated the dish. Dog was on a clam binge, and ordered the pasta with littlenecks. The menu, new at the time, promised angel hair pasta, but our pleasant bartender said the pasta hadn’t been house-made yet, so they were substituting a squid ink tagliatelle. It was a good choice, both in terms of the dish’s appearance and its fish flavor. Here’s the other thing: Ella’s specialty is actually their pizza, and a party of two could share a spectacular one and two glasses of excellent wine for less than $30, before ambling down Cranberry Highway for go-carts, water slides, or mini golf. Mezza Luna is an extraordinarily versatile restaurant. During our recent visit, we dined at the bar after a bike ride on the Canal. Near us were regulars who probably eat there every Thursday night. A parade of 30-something ladies emerged from a function room, seeking raspberry margarita refills. It’s the kind of place for a quiet anniversary dinner, 90-year-old Gramma’s birthday, out of town visitors, the purchase of a new home, or, as in our case, just a really good meal. The restaurant was closed and completely rebuilt after a fire in 2008, but the place retained a venerable feel. The bar is luxe, with dark woods and an interesting vaulted ceiling structure, and a pretty good wine list. Combined with the white tablecloths, windows onto a patio, and dark carpeting, it could seem foreboding. But bartenders Sherry and new Mary are cheerful and welcoming. Mezza Luna’s focus, since 1937, has been Italian food, and the kitchen produces a serviceable version which is tasty without giving Gramma agita. Portions are very large. During our visit, Gina ordered the eggplant parmigiana appetizer and a house salad, which may seem like an uncharacteristically dainty dinner but is plenty of food — nearly half of the eggplant made it home. Mezza Luna’s house salad is sprinkled with chick peas, which Gina loves, and some more routine ingredients. The eggplant is crisp on the edges, rich with mozzarella, and bathed in their great tomato sauce. We also recommend the eggplant fries appetizer, for those who want to pretend to make a healthy choice. The Big Dog ordered chicken and broccoli with ziti, a delicious dish with crisp broccoli, lots of perfectly cooked chicken breast, and a fabulous buttery, garlicky sauce. You will kick yourself if you order this dish and finish your bread basket before it arrives, we promise you. The chicken dish came with a house salad, and the aforementioned bread, which you can also buy to take home. With tax, a couple glasses of Ruffino pinot grigio, and a Jacobs Creek shiraz, dinner came to $54 — a great deal given the lovely surroundings, large portions, and very good food. You are currently browsing the archives for the Romantic Dining category.